The final section of this journey along the Canale Maestro della Chiana passes through the orchards and vineyards of Civitella in Val di Chiana; here you can also see the important constructions for the intake of water built in the 19th century in order to channel the waters of the side canals into the Canale Maestro. Shortly before the 56 km. mark, you pass by Ponti d’Arezzo. The modern, concrete structure that you can see nowadays has, in fact, a long history: in the 14th century, the Chiana marsh was crossed here by the Siena-Arezzo road by means of five small bridges. Later, they were changed for a two-arch bridge to which, in 1589, six more arches were added. Sluice gates were supplied to all of them so as to regulate the flow of the flooding river and to prevent the Chiana floods joining those of the Arno. A new brick and iron bridge was built in the 19th century after the Canale Maestro had been widened and deepened. Bombed during the war, this hydraulic work was reconstructed in its present version in reinforced concrete. Thus, it is the fifth framework of today’s bridge. The next part of the route, going towards Arezzo, has a mixture of traffic, passing very close to the Ponte alla Nave, which was described in one of Leonardo da Vinci’s maps in 1502. It was then already an important construction on the road connecting the Valdarno and the Val di Chiana. Near the Ponte alla Nave, the path is bounded by the Magazzino del grano [Corn Warehouse] built by the Cavalieri dell’Ordine di Santo Stefano. This is where the Grand Duchy’s farms deposited their agricultural produce, unloaded from boats and stockpiled before being sent on to the Florentine market. Having travelled for about 60 km, the journey is almost over and one of the greatest and most impressive hydraulic works, the Chiusa dei Monaci (The Monk’s Lock), is reached. It already existed in 1115, belonging to the monks of the Abbey of Santa Flora and Lucilla up until 1797. The Chiana waters acted as the source of energy for the mill where the monks made flour. Only much later was it supplied with sluice gates to regulate the flow of the waters, and it has been as we see it today since 1839, according to the project of the engineer Alessandro Manchi. The cycle path finishes right here. 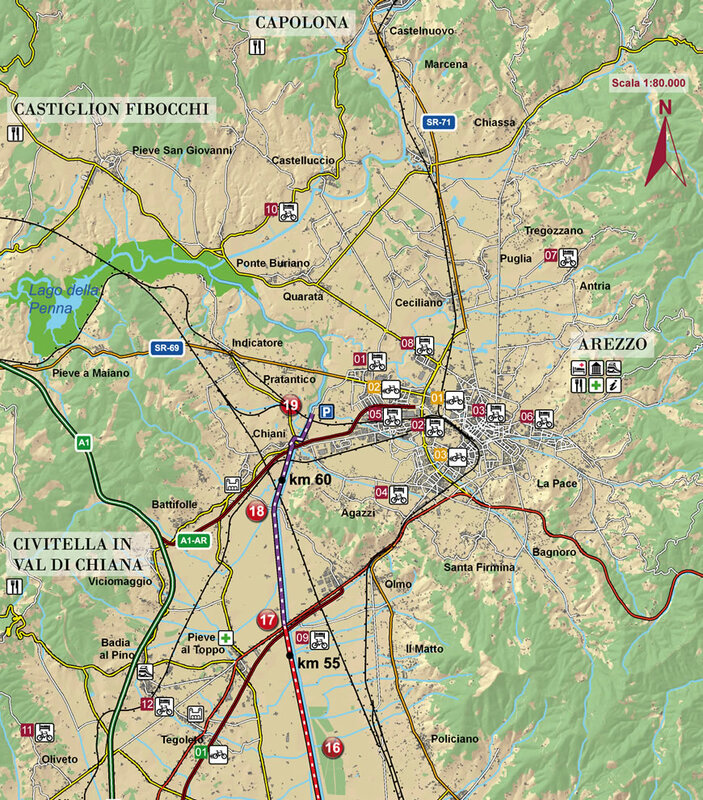 The centre of Arezzo is only 6 km away. The Canale della Chiana (The Chiana Canal) carries on flowing until it reaches and enters the Arno where the main river is dominated by the Romanesque Ponte a Buriano, which is very likely to be the bridge which you can see behind the Mona Lisa, Leonardo da Vinci’s great masterpiece.